Chairman of African Rainbow Minerals Patrice Motsepe (right) and wife Precious Moloi-Motsepe donated R15 million towards the cyclone relief efforts. 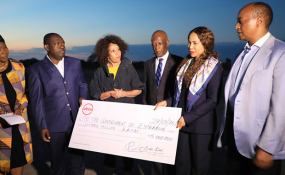 THE government of South Africa and businessman Patrice Motsepe's family yesterday donated a combined R75 million to victims of Cyclone Idai in Zimbabwe. Speaking after the donations Minister Sisulu, who was accompanied by the Motsepe family, said the donations to Zimbabwe followed President Cyril Ramaphosa's call for the people of South Africa to respond to the disaster caused by the cyclone. "We have decided as a Department of International Relations to make a financial donation apart from other donations that are coming your way," she said. "This is what we have brought to you at short notice to assist you provide the urgent relief to the affected," she said handing over the cheque to Minister Moyo. "We are in great pain and what you have done gives us a lot of hope when we find that we have friends around us who have a big heart, big hand who donate both in kind and cash towards the disaster to help us address the challenges our people are facing," she said. "This challenges us to be always prepared for natural disasters as a region and continent and put in place mechanisms to deal with such disasters," she said. "The donation will go a long way in our quest to provide assistance to the affected people." "We look forward to such kind of interaction, assistance and brotherhood to continue," he said.